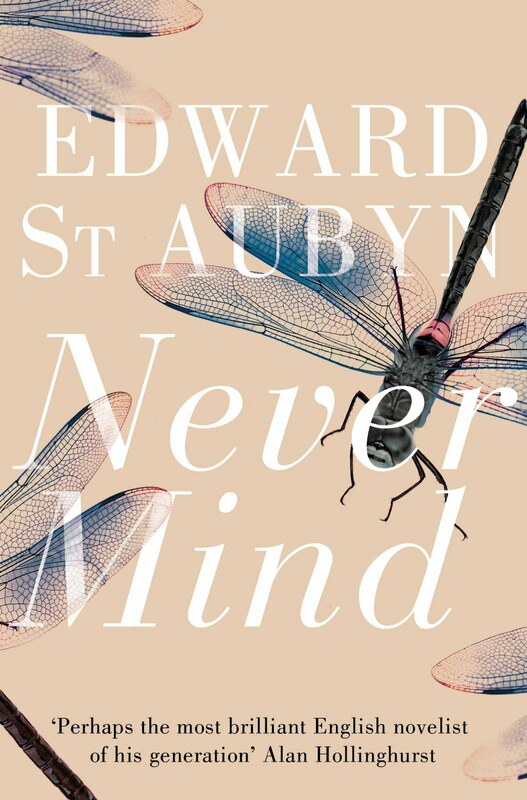 Every so often, a product is redesigned in such an innovative way that people reconsider its use. There was the brown paper bag for lunch which led to the iconic lunch box and thermos – all of which were staples in our society for those who wanted to bring lunch from home. When my daughter announced she was going vegan and would be preparing her own lunch to bring to school, she quickly realized the challenges of not only making fresh tasting food but of transporting and storing it so that the food looked and tasted just as good as when she first made it. The preparation was relatively easy; the transporting wasn’t which is how we found Black + Blum – a company that makes innovative and functional soup carriers, salad boxes, and meal holders, bags, and utensils. 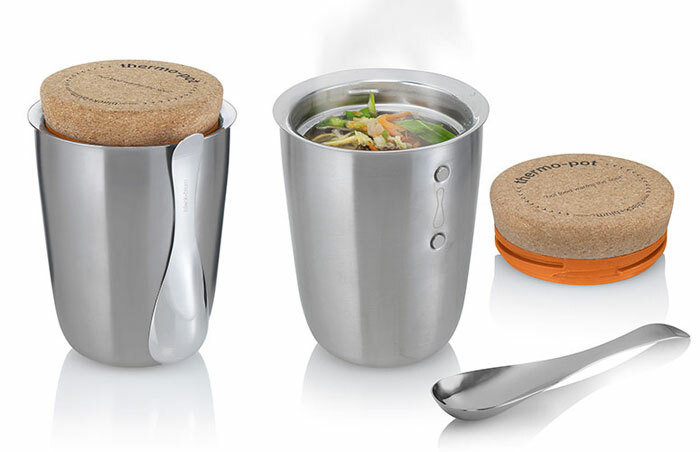 The Thermo-Pot: A stainless steel vacuum food pot that keeps up to 17 ounces of soup or food hot for five hours. The top is made of cork with minimal thread detail and a small stainless steel spoon attaches magnetically to the side of the pot, which gives it the cool factor. The Therm-Pot sells for about $42 and can be purchased at www.casa.com (30% off one item for first time users of the website), www.amazon.com, and www.uncommongoods.com. The Lunch Pot: The lunch pot is a truly innovative way to take breakfast or lunch on-the-go. 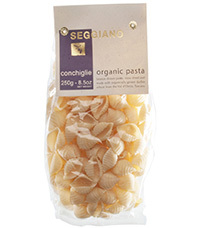 The two pots have an ingenious water tight locking seal that is the perfect vessel to carry two types of food (i.e. yogurt and granola, salad and fruit). The two pots fit together and are held in place by a strap that is easy to tighten and loosen along with a curved spoon that fits snugly into a thin pocket opening in the strap. The smaller pot (holds up to 10 fluid ounces) also fits in the larger pot (holds up to 18.5 fluid ounces) for compact carrying when empty. Available in three colors: black with red trimming, white with green trimming, and white with orange trimming, the Lunch Pot sells for about $22 and can be purchased from www.casa.com or www.amazon.com. BPA free, microwave and dishwasher safe. 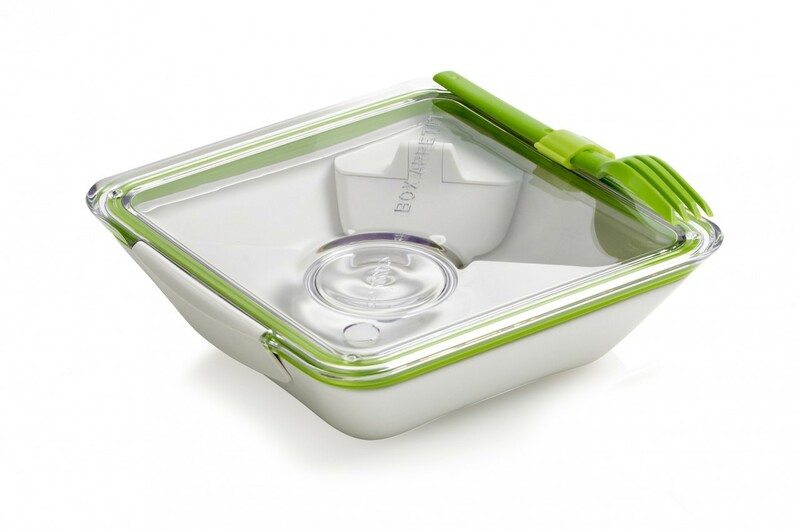 Box Appetit: The Box Appetit is a revolutionary lunch bowl that can hold salad, sushi, or prepared food in the center. There are also two lidded containers that fit into the corners of the interior: a small one for a salad dressing or dipping sauce and a larger container to hold salad toppings to mix when ready to eat or to hold a food that can be warmed in the microwave. The clear lid locks to the body of the bowl providing a water tight seal. Available in white with green trim , white with orange trim, or black with a red trim, the Box Appetit holds up to 30 fluid ounces. A matching fork and knife attach to the exterior. The Box Appetit sells for $18-$22 and can be purchased from www.casa.com or www.amazon.com. 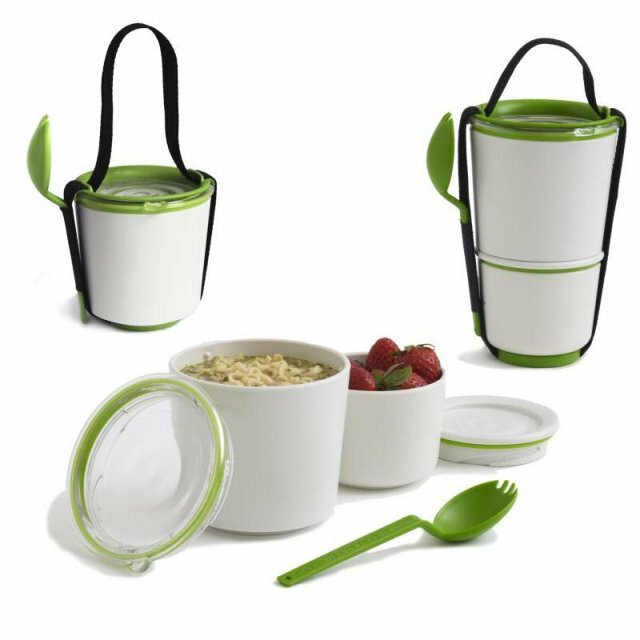 BPA free, microwave and dishwasher safe. Box Appetit Bag: The Box Appetit Bag is designed to carry the Box Appetit lunch bowl along with a drink and a piece of fruit. Made of nylon with an insulated lining, the bag will keep cold foods cool and double as a place mat (this pleases the “Martha” in me more than it pleases my daughter). The bag is waterproof and has a velcro seal on the sides with an easy to hold handle to tote along. The bag sells for about $8-$9 and comes in black, red or green with a black trim. Available from www.casa.com and www.amazon. com . The Bento Box: Half the size of the Box Appetit, the Bento Box can hold up to 17 fluid ounces and has a small container to hold salad dressing or dipping sauce. 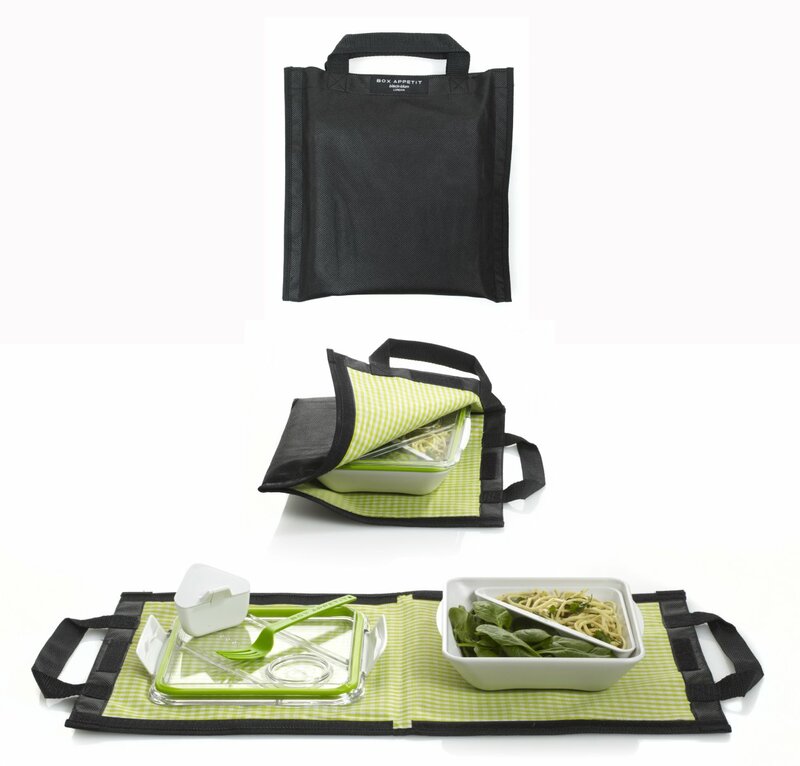 Perfect to tote along sushi, pasta, rice, or a small salad, the Bento Box has a water tight seal and has a clip to hold the fork provided (or your own chopsticks). 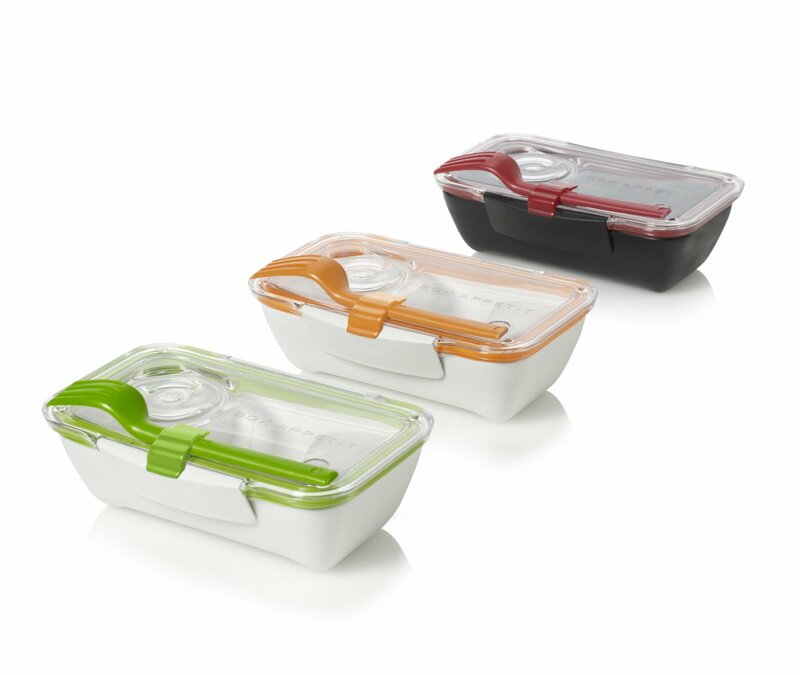 BPA free, microwave and dishwasher safe, the Bento Box comes in three colors: black with red trim, white with green trim or white with orange trim. 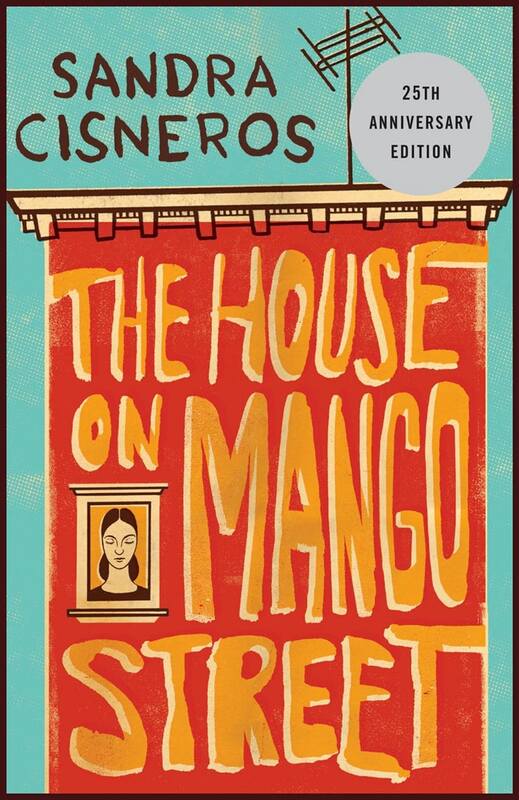 The purchase price is $16-$19 from www.casa.com or www.amazon.com.